In the St. Louis area, any concrete structure that is placed below grade is subject to exposure to groundwater. In the past, older houses that were fairly leaky dealt with moisture migration through the foundation and floor by the simple fact that they were not built very tight at all. However, as we are building tighter houses to be more energy efficient, the moisture and potential bulk water that can comes through the foundation must be dealt with properly. There are 3 primary ways in which this can be accomplished. Interior installed perimeter dewatering system. 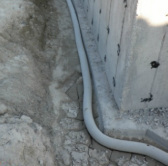 An interior dewatering system is usually installed by demolishing a band of concrete floor along the inside of a foundation to expose the footing. A trench is excavated along the footing in which a perforated pipe is installed, then the concrete is replaced, often with some sort of drain channel or flashing installed between the repaired floor and the wall. What this system does is allow any water that comes up from below or under the wall to be captured by the system and discharged by a pump far away from the house. Interior systems are often supplemented by a wall mat installed over the foundation wall to capture moisture passing through the wall, but not always. Exterior installed perimeter dewatering system. While nearly identical to an interior system, this system requires excavation and exposure of the footing from the outside. The benefit for this type of system is that a heavy duty foundation coating can be applied to significantly minimize moisture migration through the wall. Often overlooked, many moisture and bulk water issues in a basement can be addressed simply by reworking the landscaping. A basement foundation should extend at lead 6-8 inches above grade. This includes surface coverings like mulch or gravel. If you don’t know where the top of the foundation is, you can measure down from the lowest brick or piece of siding instead. The grade next to the house should be slightly sloped away from the house for at least 10 feet. The same goes for any patios, walks, and driveways. 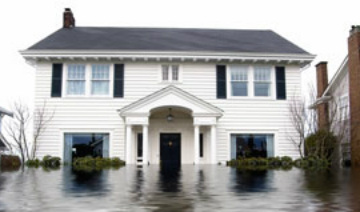 Everything should slope away to help rainwater flow around the house instead of up against it.